The velvet is traditionally said to have been woven in Spitalfields, London, although there is no documentary evidence to support this. Stylistically this is possible, if compared with designs by the Spitalfields silk designer and master weaver James Leman. Without other supporting evidence high quality multi-coloured furnishing velvets such as this are usually presumed to have been woven in Genoa, Italy. Description by Natalie Rothstein: Design of archway in red and yellow, with large flowers and vases. 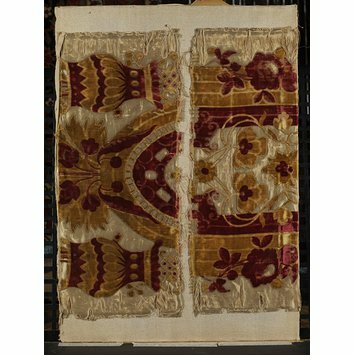 Pile on pile velvet in two colours with uncut loops surrounding the main outlines of the design, now much worn. Voided satin ground nearly all cut away. The design is incomplete both in length and width. The velvet is applied to a backing of silk and linen (warp and weft) which is now also much worn. No selvedges. Warps : about 6 foundation warp threads to one pile, and pile warp threads alternately red and yellow. Foundation - cream silk single threads s thrown, organzine or poil. Pile - triple threads organzine (2 ends in each) s thrown z plied. Decoupure of 1. Weft - 1, cream spin (possibly) silk, z. 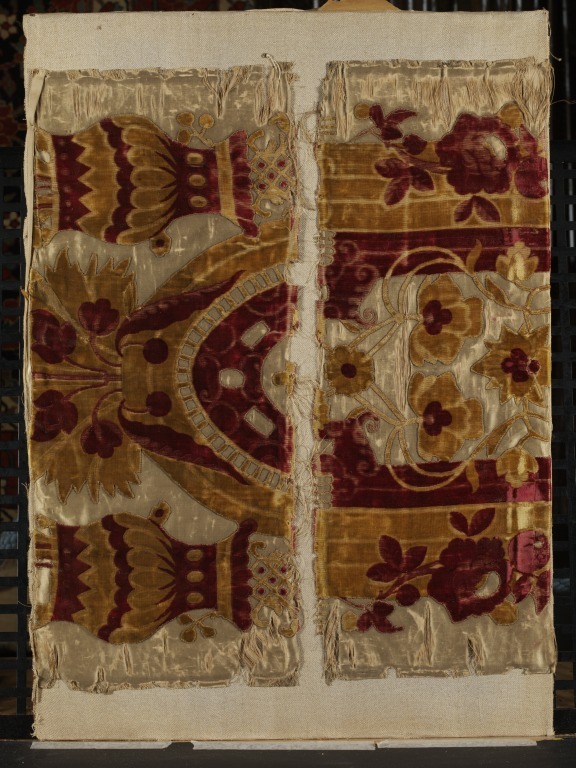 Same pattern as the furnishings of a bed made for Queen Anne for her use at Windsor Castle in 1714; cf loan:Royal Elizabeth 978 and W.15-1931. Registered File no. 1930/6358. Warner & Sons wove a reproduction of this silk in 1912. T.424:230-1997 : described as 49713, 49682, 49940, 21" Queen Anne Velvet, Warner & Sons, British, 1912 10/2. Registered File no. 1930/6358. Jolly, Anna. Fürstliche Interieurs : Dekorationstextilien des 18. Jahrhunderts. Riggisberg: Abegg-Stiftung, 2005, cat. no. 7.